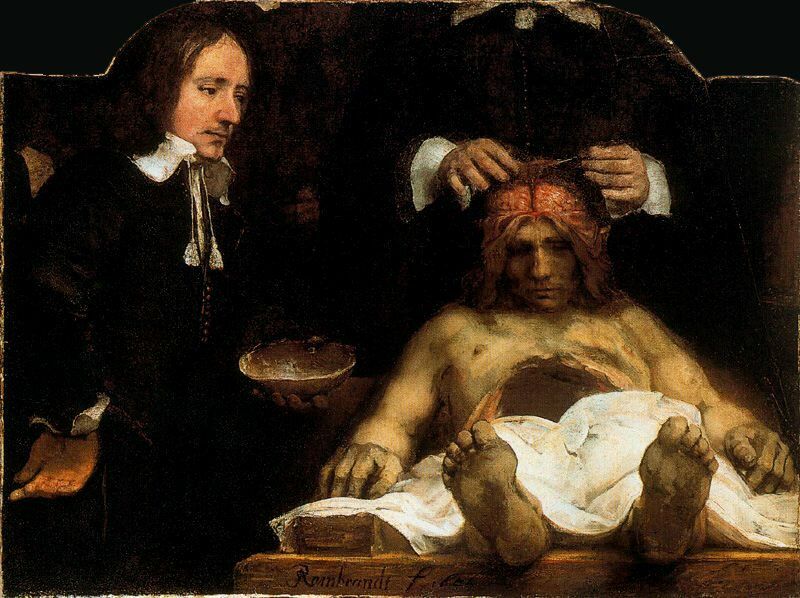 Dr. Joan Deyman had succeeded Dr. Nicolaes Tulp in the redoubtable position of the guild’s Praelector Anatomiae — the physician entrusted with the guild’s once-per-year public anatomical reading over the dissection of an executed criminal. In his day, Tulp and his dissection had been painted by Rembrandt. With the new praelector in the wealthy city came its guild’s need for fresh art to keep up with the Joneszes. New subject, new work … but the same artist. A mere sapling when he rendered Dr. Tulp, Rembrandt was a fully mature painter of 50 when he put this scene to canvas. Sadly, this painting was damaged in a 1731 fire, destroying most of its figures, including the titular one. Braaaaaaaaaaaaaiiiiinnnnnssssssssss! Dr. Deyman’s hands are all that remain of him. The cadaverous Joris Fonteyn, however, belongs to the ages. Wednesday, February 2, at 9 o’clock in the evening the body was interred with fitting dignity in the South Churchyard.